A part of the University of Toronto’s Sesquicentennial Commemorations and hosted by the University of Toronto’s Health History Partnership (http://health-humanities.com/toronto-health-history), (IM)MATERIAL CULTURE: Health History Collections in a Digital Era, an interdisciplinary symposium, took place on November 10th and 11th, 2017. (IM)MATERIAL CULTURE began with an evening reception and keynote address on the Symposium’s themes (Friday, November 10). This was followed by an inter-professional (IPE) education day (Saturday November 11) at the Medical Sciences building, with panels, speakers and exhibits charting the evolution of health history collections in a digital era. Invited speakers represented a broad range of collections relating to health and the body. These included biobanks, anatomical collections, and anthropological collections, as well as collections of medical technology. 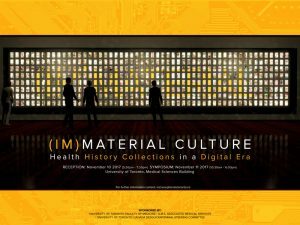 (IM)MATERIAL CULTURE focuses particularly on broadening perspectives on health as represented through material culture. It explored ‘the invisible’ within collections (i.e. the material culture of groups who were not considered relevant to include) or misappropriated, with speakers and panelists who represented populations historically excluded from Health History collections. This symposium was drawn upon perspectives and methodologies from a variety of disciplines including Indigenous Studies, Disability Studies, Sexual and Diversity Studies, Black Canadian Studies and Mental Health Studies which speak to the importance of diversity-enhancing and ethical collection policies. High school students from the Faculty of Medicine’s Summer Mentorship Program, who were exploring the material culture of health through individual research projects on local objects, presented their projects. This Group Learning program meets the certification criteria of the College of Family Physicians of Canada and has been certified by Continuing Professional Development, Faculty of Medicine, University of Toronto for up to 5.5 Mainpro+ credits. This event is an Accredited Group Learning Activity (Section 1) as defined by the Maintenance of Certification Program of the Royal College of Physicians and Surgeons of Canada, approved by Continuing Professional Development, Faculty of Medicine, University of Toronto. You may claim a maximum of 5.5 hours (credits are automatically calculated). This conference has been accredited as 1 Exposure (competency level) elective credit through the University of Toronto, Centre for Interprofessional Education.